A passage way symbolizes an opportunity, a decision, the unknown. The phrase conjures several images, several responses. The primary image for me is that of a spring forest, a damp and trodden path, fresh vibrant leaves blocking out the sun, low in the sky. Dew covered ferns line the path. At my furthest point of vision, there is a stone archway, not so large it is imposing but enough to block my view of what is beyond. Perhaps it is all my years exploring the forests in the Adirondacks, perhaps my saturation in pastoral 19th century British literature or youthful fairy tales. In life, our paths are not often lined with ferns or lighted for mystery. They are choices. We can’t know the full outcome but we follow our heart, our dreams. With enough tenacity, we create a life beyond the archway. When Cynthia Cosco left her career of fifteen years to enter the world of wine, she did not know where it would ultimately lead. She began with in-store wine tasting which led to harvest. Harvest led to wine chemist and enology school. 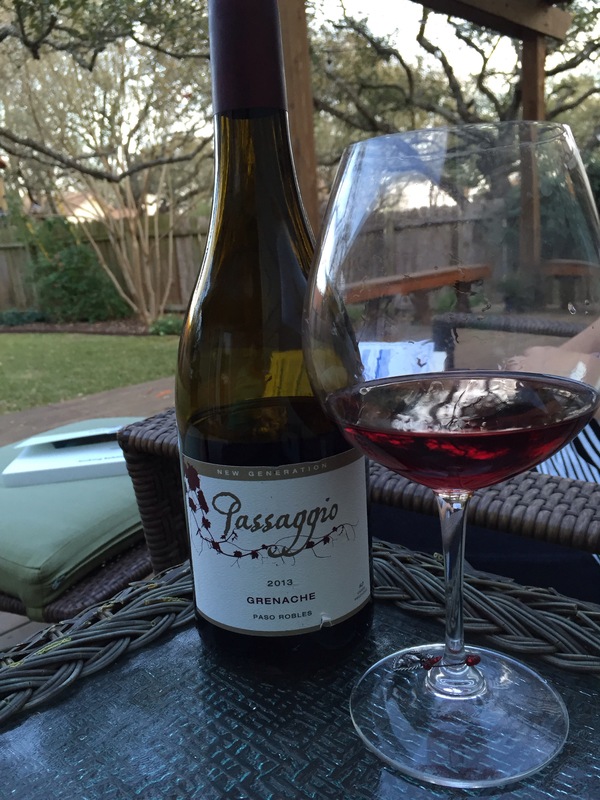 Eventually, this led to her passage way, Passaggio Wines. I recently received samples of her 2013 Grenache from Paso Robles and the 2014 Sauvignon Blanc from the Russian River Valley. The Sauvignon Blanc was pale lemon-green, a clean nose with citrus and green apple. On palate, the citrus faded into green mango and white flower. Granny smith apple skin on the finish. Fresh, inviting, and easily paired or as an aperitif. I started the bottle with some goat cheese and ended with grilled salmon with lemon and herbs. Lovely with each pairing. Some wines you just don’t want to end. The Grenache was one of those wines. We opened it on the porch after my first day of WSET 2 classes. What a reward! Brilliant ruby in the glass. Raspberry, cranberry, and nutmeg on the nose. Medium acidity, lower tannins, light to medium body. Red plum, cranberry, bright red cherry, pepper and savory notes. We paired this with filets at my husband’s request. My instinct was to do smoky pork so I compromised with some bacon and parsley in the mashed potatoes. It was delicious. If you’ve spent any time hiking, you know that sometimes a path is well-marked. Splashes of paint on bark or boulder tell you the way. The trail is worn, the topography dictates. Other times, we aren’t so lucky. Three or more trails converge without indication. We have to use what we know, sun path, moss, waterways, our instincts. Often, my husband will run ahead to confirm before the children and I follow. It is nice to have that support. In life, we can’t always count on a map or a scouter. We have to listen, pay attention to indicators, trust our instincts. There will be missteps and missed opportunities. But each step carries us to new understandings. Each path opens to new views. Each passage way reveals and brings us further in our story. My friend, Elizabeth, The Traveling Wine Chick, deviated from her path as well. Once in academia, she now works in Napa with Cynthia. Each followed their passion and began a new path, not without challenges, but with plenty of rewards. They share their stories and more in the Facebook Follow Your Passion group. Many thanks to Cynthia and Elizabeth for inspiring and sharing these lovely wines. Thank you for the wonderful review…Looking forward to seeing you soon! Thank you for the wonderful wine! I have had and really enjoyed the RRV Sauv Blanc. The Grenache sounds delicious! Lovely article. Good luck with WSET 2!